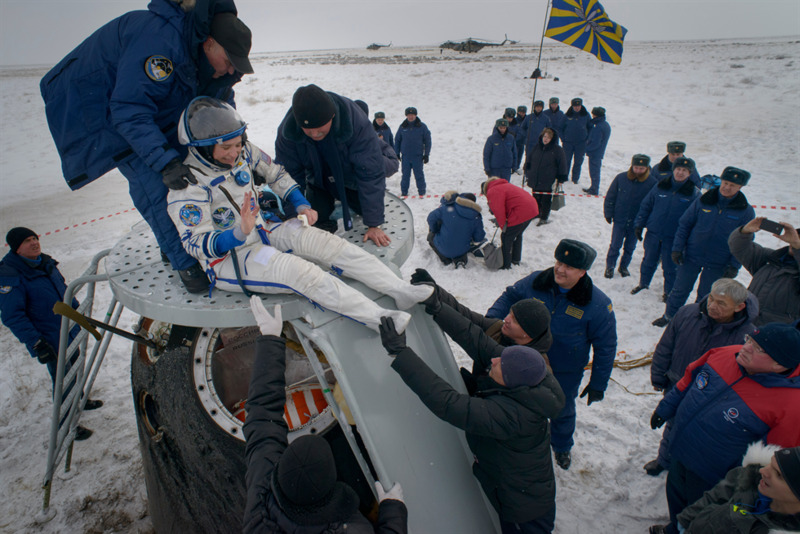 NASA astronaut Serena Auñón-Chancellor, German astronaut Alexander Gerst of ESA (European Space Agency) and Russian cosmonaut Sergey Prokopyev safely touched down on the snowy plain of Kazakhstan on Dec. 20. The trio spent 197 days in space working as part of Expeditions 56 and 57. When Auñón-Chancellor and her crewmates returned from the International Space Station, the physicians supporting them in Kazakhstan—and then aboard the direct return aircraft—had an innovative new tool at their disposal: the Butterfly iQ ultrasound. Ultrasound can be an important diagnostic tool for physicians, but higher image quality has historically been dependent on multiple probes and hardware too cumbersome for typical field conditions. Owing to new cutting-edge technology, the Butterfly iQ is small and portable, yet highly capable. It connects directly to a smartphone, allowing physicians to immediately analyze images or transmit them to specialists through secure cloud storage. And, unlike ultrasound machines of past generations, this one has a single universal probe that works well on all organs, tissues and blood vessels. Thanks to a collaborative effort and the unique expertise of NASA Human Health and Performance contractor KBRwyle and the Translational Research Institute for Space Health (TRISH) at the Baylor College of Medicine, NASA Medical Operations became one of the very first users of this novel capability. In spring 2018, TRISH recognized the potential in adopting this advanced technology for spaceflight, bringing together the Butterfly Network, Inc., and KBRwyle. KBRwyle personnel then worked closely with NASA to prepare for rapid integration of Butterfly iQ into astronaut care. International Space Station Crew Surgeon Dr. James Pattarini and Auñón-Chancellor jointly conducted a technology demonstration at the landing site in Kazakhstan, making NASA the earliest user of this ultra-portable device in austere field conditions. Soon after, Dr. Ashot Sargsyan with KBRwyle was able to evaluate the quality of images by accessing cloud storage. The Butterfly iQ showed great promise in the harsh environment, demonstrating that—within seconds—high-quality medical imagery can be made available for physician evaluation. Applications for this nascent technology could stretch beyond the spaceflight realm, helping to facilitate medical decisions in any limited-resource setting.